Hi lovelies! 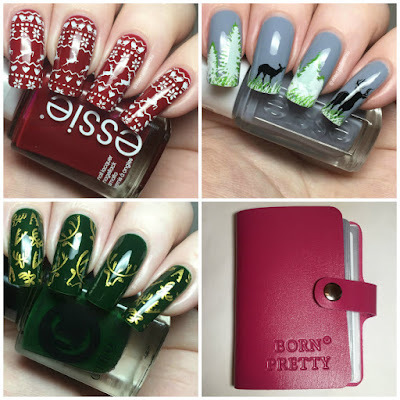 Today I'm back with a review of some more Born Pretty Store items (see my last review here). This time round I have three plates and a plate holder to share with you. All three plates have a wintery/Christmas vibe, and arrived just in time as I'm really starting to get into the Christmas spirit. Now that we're in December, Christmas nails will be everywhere! Read on to see each item, and for more info! The first plate I chose is BPX-L008 (item #36245, online here), a rectangular plate full of Christmas designs. 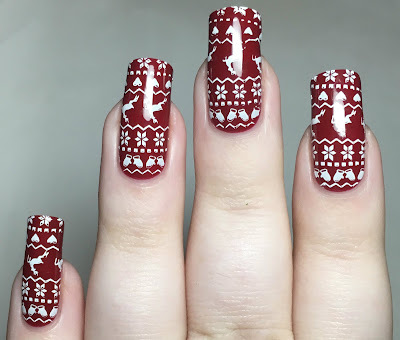 Christmas jumper type patterns are always my go-to for the end of November and beginning of December, so these were the first ones to jump out at me. 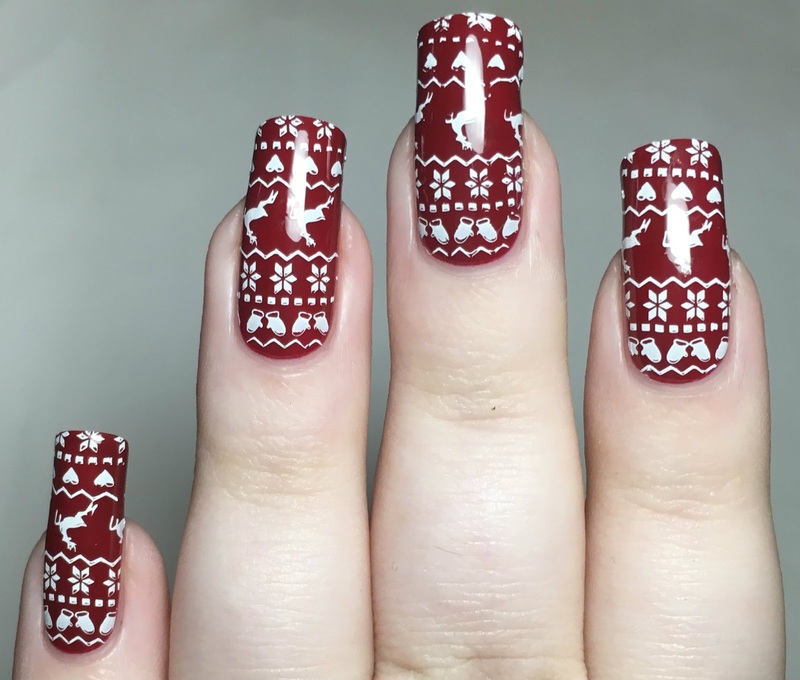 I decided on the bottom left image with mittens, snowflakes, and reindeer. 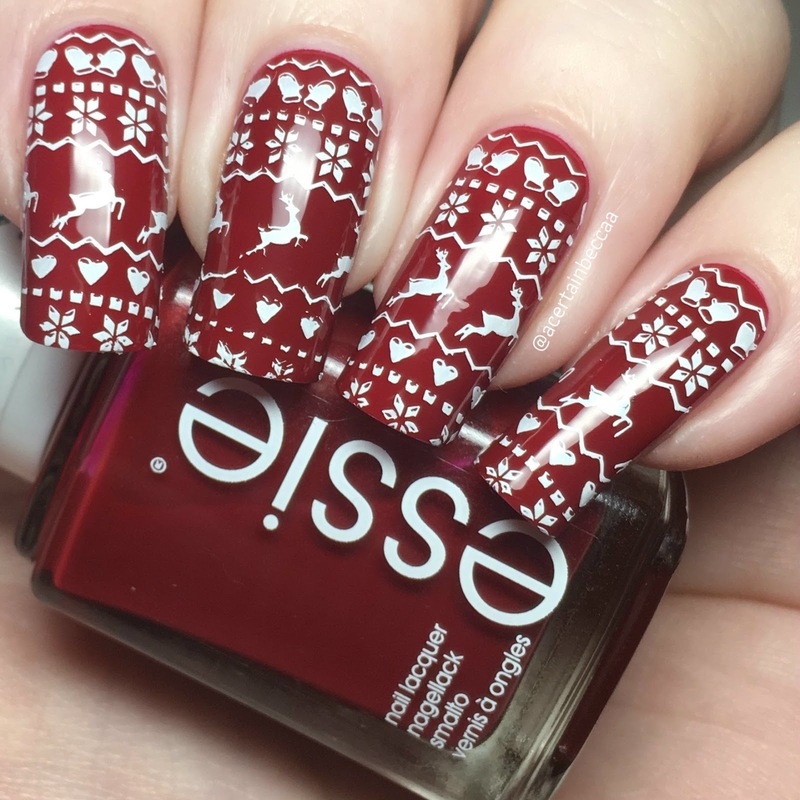 I stamped in white using Hit The Bottle 'Snowed In' over Essie 'Fishnet Stockings'. The second plate I chose is BP-L011 (item #19366, online here), a rectangular plate with Autumn/Winter designs alongside a big buffet flower image. For this one, I decided to stamp a snowy winter scene. 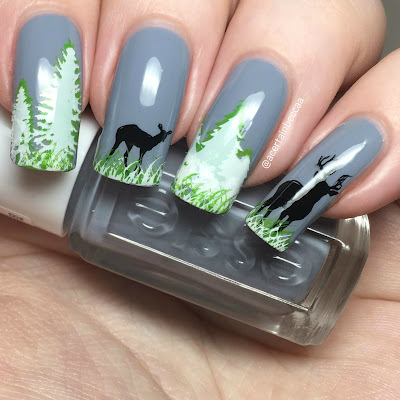 I used a base of Essie 'Cocktail Bling', and stamped the various deer and tree pictures, layering the images to create my desired look. As my stamping polishes I used Hit The Bottle 'Snowed In', as well as a Born Pretty Store black and green. The last plate is BP-192 (item #41081, online here), a small circular plate with deer and reindeer images. This time I went for a deep green base, using Cirque Colors 'McKittrick'. 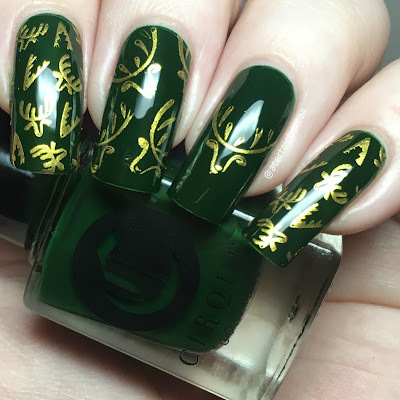 Using a Born Pretty Store gold stamping polish, I then stamped one of the full nail patterns on my index and pinky fingers, and one of the larger reindeer heads on my ring finger. 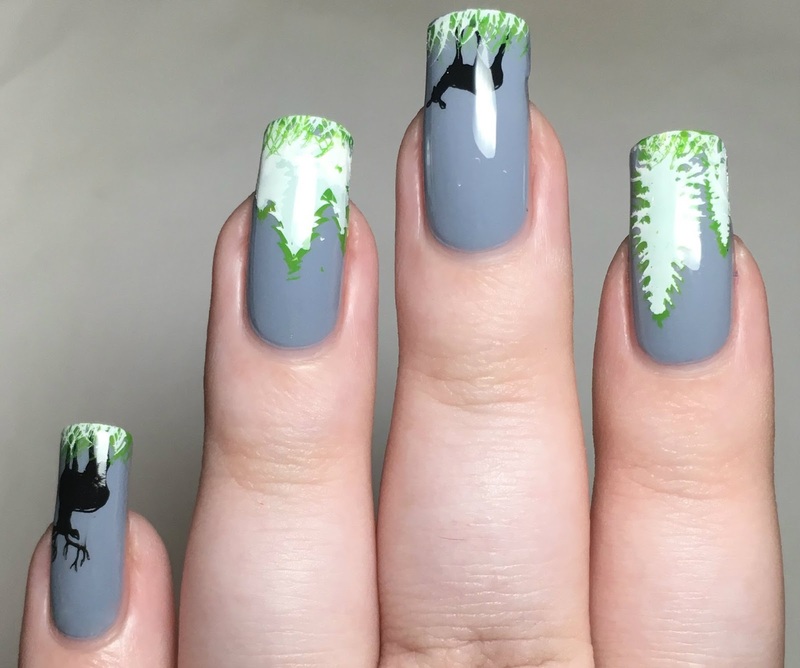 On my middle finger, I stamped the same singular reindeer at various angles to create a full pattern. To accompany my plates, I also chose a new plate holder (item #20045, online here) as my last one is already packed full. I went for the standard pink Born Pretty holder, which claims to hold 20 rectangular plates. There are 20 sleeves inside the holder. Each one only opens on one side, so if you put two plates back to back (so you can see one on each side), you can actually fit 40 plates in! What do you think? 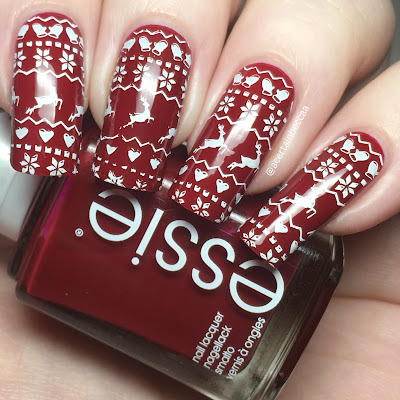 Are you feeling Christmas designs yet? I can only apologise if you aren't, as I'll be sharing a lot more between now and the big day! As always, I'm highly impressed with all of the Born Pretty items I recieved. I never have any issue picking up and transferring images from their plates, and the holder is better than I'd hoped as it holds double the plates. You can find all items mentioned, along with countless others, on the Born Pretty Store website here.